This weekend, our s’mores got the opportunity to attend a brunch called “Keep the Drama on the Stage,” which brought together young women of color to foster solidarity, rather than competition for limited roles in film, stage and television. 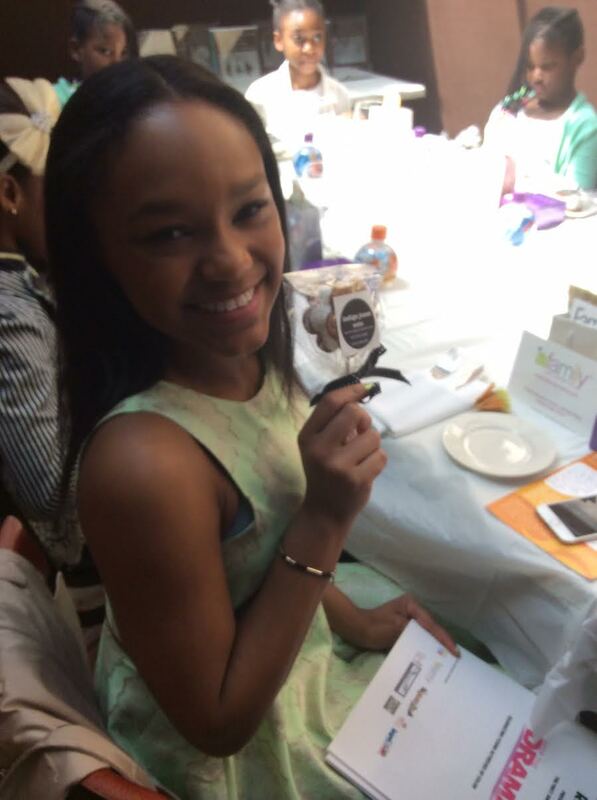 Eden Duncan-Smith has already forged a successful career at age 15, with roles in the film, “Annie,” and the Tony award winning plays Fences, and The Lion King. She is currently in “Meadowlands,” which is debuting at the Tribeca Film Festival this month. Our flower shaped s’mores on a stick got rave reviews. Maybe there is an award in our future some day too!! To order s’mores, go to our food site: indigo jones eats, or visit our Etsy shop. This time of year, it is easy to attribute that stuffy nose, irritated eyes and itchy skin to allegries. Often, that is exactly the case. But did you know that mold exposure can cause some of the same symptoms? Mold can be spotted growing on bread, fruit or even between the tiles of the shower; virtually anywhere where moisture is present. The coffee maker is a prime spot for harboring hidden mold, especially the types that use those convenient little pods, such as Keurig. Because the main tanks of these coffee makers can’t be drained, they provide the perfect environment for mold to grow, especially when left unused for a period of time. There are steps you can take to clean the machine and ensure it is mold free. Check the drip tray and around the rubber ring to make sure no mold is present. Wipe it down before putting it back. Wipe the entire machine, inside and out, as best you can and be sure to clean the needle. Run the machine through a few times to clean the mechanism. If you are using a pot where you add your own water, use a mix of vinegar and water, or baking soda and water for the first run, and then run the machine with clean water for the subsequent rinses. Keep coffee machines as dry as possible before putting them away. If you have access to filtered water, use that to make coffee to avoid the build up of minerals in the pot. We love playing with the classics and finding new ways to style our favorites. 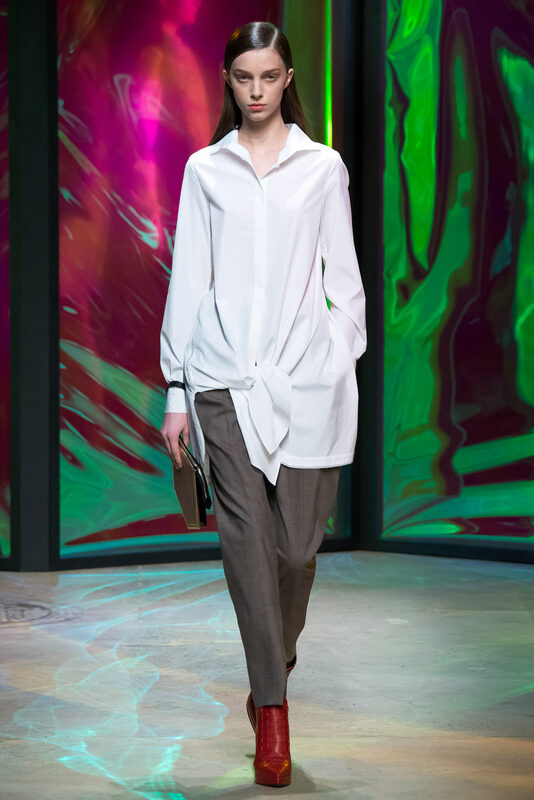 Reinventing the white shirt through dramatic proportions takes an old standby to a new level. Thakoon soften this scaled up version by tying it at the bottom. When one great shirt is not enough, try layering two! We love this crisp white tank over the superlong blue shirt. The Man Repeller, Leandra Medine is caught with her pants down on the streets of New York, and she looks great! This one says “short in the front and party in the back,” when tucked into chic slouchy trousers, from Christina Braun. 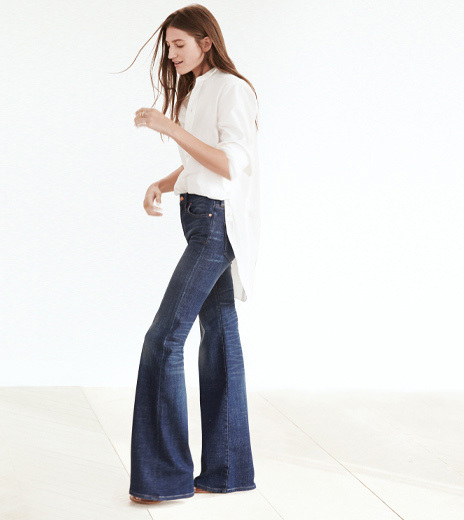 After years of living in our skinnies, flare legged jeans are back with a vengeance. We have seen this coming for quite awhile, but the 70’s frenzy that swept the spring ’15 runways have solidified the trend and elevated the flare jean to “must have” status. 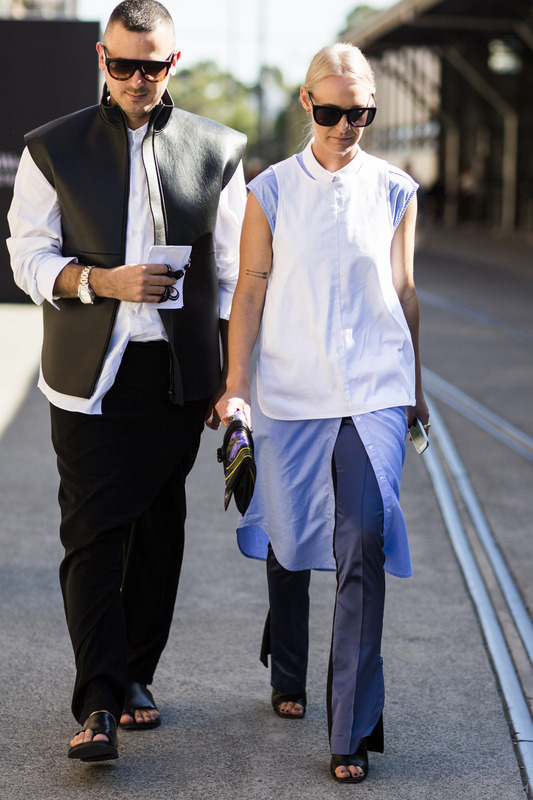 The key to wearing this iteration of the trend is polish. This time, rises are a little higher, and they are paired back to cleaner, more refined casual items. Tuck a soft easy shirt into a higher waisted jean. The monochromatic look adds to the illusion of length. Head to toe white is crisp is and modern. Add chic and black and white elements to up your style game. Keep it simple, and keep it crisp. We love the extra long shirttail in this half tuck! Add a classic pea coat to look and show your stripes. 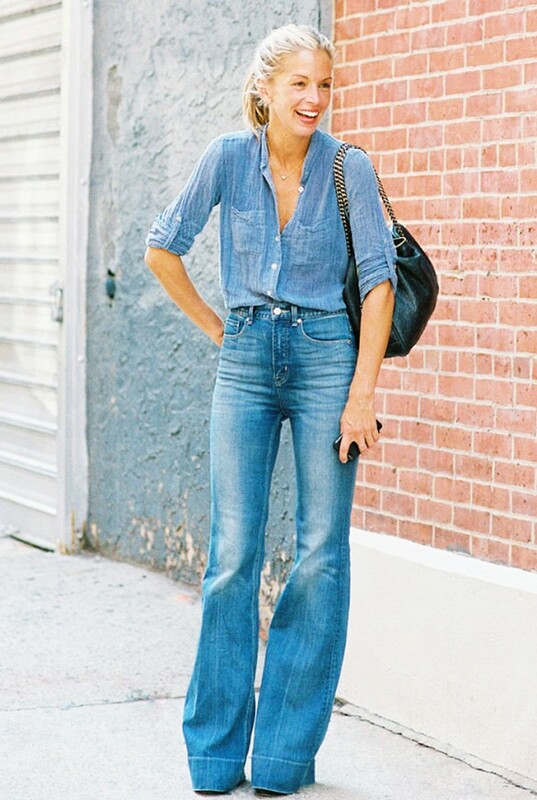 The mariner tee is the perfect accent to these dark blue flares. Sometimes someone comes along and invents something so obvious, we wonder why nobody thought of it before. Often they are game changers, but sometimes, they are just another thing to spend money on that we don’t really need. These are just a few of the latest new products we’ve stumbled upon that fall into that bucket. Almost every woman I know with long hair either has an elastic hair tie around their wrist, or the tell tale red ridge where said item has left it’s mark. The husband and wife team behind BitterSweet Jewelry has tackled the hair tie dilemma, by introducing a bracelet with an indented area designed to hold those little elastic bands until you need them. It is a case of form meets function, and allows those little necessities to blend seamlessly into your arm party. These bangle style bracelets come in a variety of metals and range from $45-$85 each. Have you ever been out in a downpour and although you were protected by rainboots, a coat and a hat, your expensive and perishable leather handbag was exposed to the elements and getting drenched? 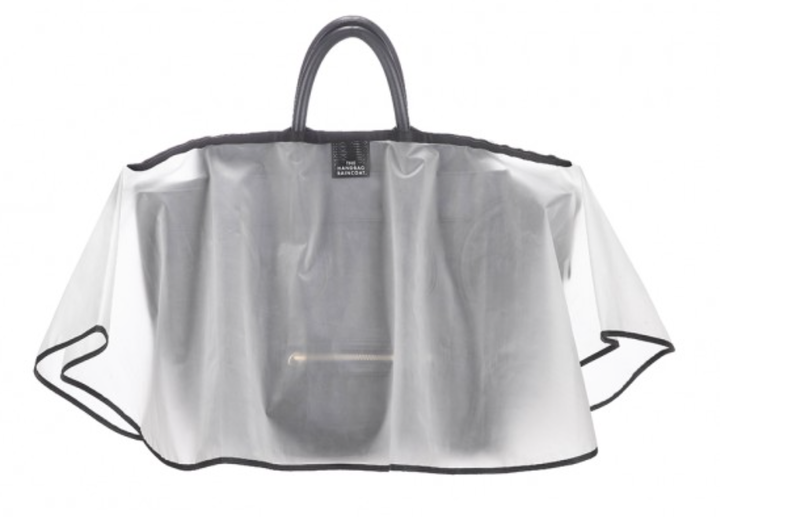 Worry no more, the handbag raincoat is here! These waterproof ponchos for your handbag come in a variety of sheer plastic colors, patterns and sizes, and sell for $25 – $30. Are these new products genius, or completely gratuitous? Tags:bracelets, genius inventions, gratuitous inventions, hair tie bracelets, hair ties, handbag covers, handbag raincoats, jewelry, why didn't I think of that? Today’s tip is such a no-brainer, that when I saw it on one of my favorite websites, The Kitchn, I literally felt dumb. I mean, why didn’t I think of this? I have extolled the virtures of the immersion blender on these pages before, and my cupboard is well stocked in mason jars. So what is this fabulous tip? Instead of using a big bulky blender, try using a hand held immersion blender in a large mason jar. It’s easy to do, easy to clean and storing whatever you just blended is as simple as adding a lid to the jar. Its genius, right? You may never use your blender again! Did you ever wonder how long it takes for a junk food binge to catch up with you? According to an article in TIME magazine, the answer is about five days. In a study published in the journal Obesity, just five days of a poor diet, rife in fatty processed foods, is enough to change the body’s healthy response to food. The study focused on 12 college aged men who were put on a diet in which 55% of their total caloric intake came from fat, 18% of which was saturated. The control group ate a much lower fat diet, with the identical amount of calories. Muscle biopsies were taken before and after the experiment. 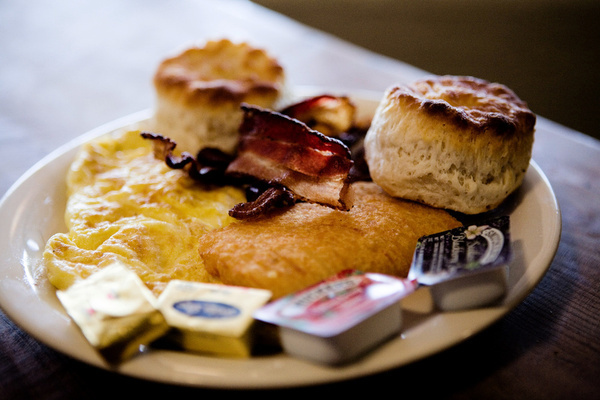 The high fat group spent the week gorging on Western dietary staples such as mac ‘n cheese, ham and cheese sandwiches slathered in butter and mayonnaise, and fatty microwavable meals. Even McDonald’s could not supply enough dietary fat in one meal to meet the study’s criteria. After only five days on the extreme high fat diet, metabolic changes began to occur. The body’s normal response to a meal was either blunted or obliterated, compared with how the men responded prior to the test. Under normal eating conditions, the men’s biopsied muscle oxidized glucose to use as an energy source. Just a few days later, this function was completely shut down. This information brings about many questions that the scientists will continue to explore, including those related to weight gain and diabetes. We love shrimp at our house. It is low in calories, cooks up quickly, and adapts well to a variety of preparations. This unrecipe was adapted from Ina Garten, one of my all time favorite chefs, known for her fresh, simple and very tasty cuisine. 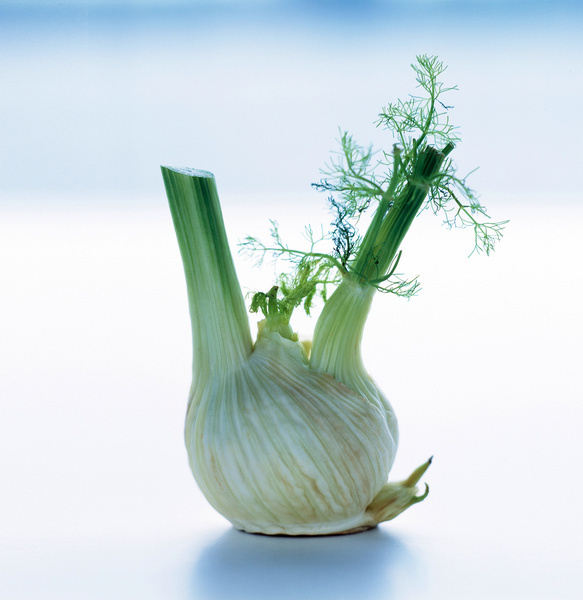 Core and dice the bulb end of fennel and saute in olive oil until it is starting to soften, about 6-8 minutes. Add 2-3 cloves of garlic, finely diced and stir another minute. Pour some dry white wine ( 1/2 cup or so) into the pan and cook until the liquid reduces by about half. Add a can or box of diced tomatoes in their liquid, a dollop of tomato paste, and spoonful of dried oregano. Continue to cook at medium/low heat for another 10-15 minutes to create a rich, chunky sauce. Season to taste with salt and pepper. Arrange a pound of peeled and deviened shrimp on top of the sauce, and sprinkle it with crumbled feta cheese. Mix together a cup of breadcrumbs, chopped parsley and the zest of one lemon with 2 tablespoons of olive oil, and sprinkle the mixture over the shrimp and feta. Place the pan in a 400 degree oven for about 15 minutes, or until the shrimp have turned pink and opaque, and the breadcrumb mixture is golden brown, but not burnt. Squeeze a little lemon over the dish and enjoy! verb (used without object), RSVPed orRSVP’d, RSVPing or RSVP’ing. Don’t forget to RSVP before Thursday. He sent a lovely bouquet of flowers with hisRSVP. (used on an invitation to indicate that the favor of a reply is requested). This week, I hosted a dinner party for a group of parents from my daughter’s school. The school provided a guest list that had 31 guests on it, many of whom I did not know. I received 2o responses, and despite multiple resends of the invite and a group message, 11 people still did not respond. In this case, the host had the option of providing the meal, or coordinating a pot luck. Since cooking is my passion, I opted to cater the event myself, with a beverage sign up sheet for wine and soft drinks. Five people signed up to contribute. Many of the other hosts opted for potlucks, or ordered food. I am sure some of the parents thought that it was no big deal, hence their lack of response. Frankly, it isn’t a big deal to anyone other than the host of the party. Even serving hot dogs requires a head count. I toyed with my options. Cook for the amount I knew were coming, or incur the time, leftovers and expense of covering for the extra 11 people, “just in case.” I tend to over do it when I entertain, so I knew that I would have plenty of food if a few extra dropped by, but 11 extra? I wasn’t so sure. I decided to do an antipasto table, with dips, cured meats, and roasted vegetables to start, and serve a casual buffet dinner when most of the guests arrived. That included salads, wild mushroom tarts and 7 pounds of shrimp cooked in a tomato and fennel sauce. The doorbell started ringing promptly at 6:30. And then it stopped. Exactly 10 people came. Ten. If I had a proper headcount, I would have done things very differently. In fact, for 12 people (including ourselves,) I could have prepared a nice sit down dinner, instead of huge quantities of a vast variety of food, some of which looked like it was barely touched. It was a pleasant evening, and I met some people who were new to the school community, and got to know a few who I only knew superficially. They were all warm, lovely guests, and I sent each one home with containers of food to enjoy at another time. I also threw away huge quantities of dishes that I felt had sat out too long to safely save, and packed up the rest. I am sure some of it will spoil before it will get eaten and end up in the garbage, due to the sheer quantity of it. It was my pleasure to host these families, so I don’t want to appear bitter or regretful. I am however, a little peeved that people cannot take 2 minutes to let their hosts know if they intend to come, and alert them if they have a change of plans. It’s the wastefulness that is nagging at me, not to mention the expense of preparing food for people who didn’t show up. The solution? I don’t have one. I don’t believe in being an apathetic host and not going out of my way to provide a wonderful meal and a warm atmosphere to anyone that comes to our home. I don’t have any hints to get people to respond, as after 3 resends and a friendly reminder, I was coming perilously close to being a stalker. I can however, use this forum to remind you dear readers, that being a good guest is as important as being a good host. So, in case you were wondering, RSVP stands for “respondez vious sil vous plait”, which is French for “please respond.” Next time you get an invitation, please do. Freshly whipped cream is an amazing finishing touch to desserts and takes a bowl of strawberries to the next level of delicousness. 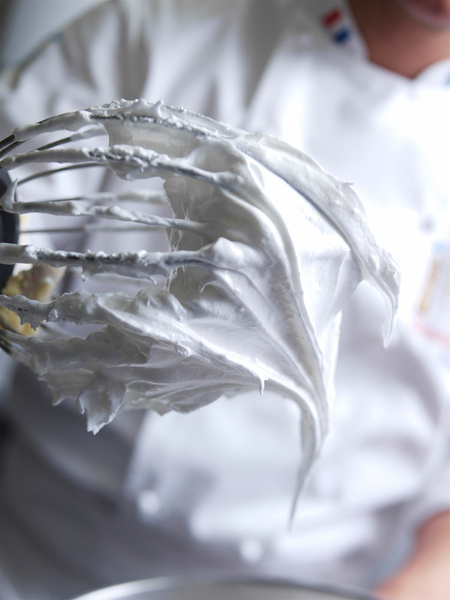 It isn’t very difficult to whip cream if you have an electic mixer, but if left unattended, it can start to become butter. While fresh sweet cream butter is incredibly good, it probably isn’t what you were planning to put on top of your pie. If it starts to go too far, no worries. Just add a little bit more of the heavy cream to the bowl and whisk it in to bring it back to the consistency you were looking for. Of course you need to have more cream on hand to do this. Perhaps saving a few tablespoons, “just in case” isn’t a bad idea for distracted or newbie cooks. A little vanilla extract, bourbon or flavoring of your choice is also a nice touch.